Those of you that know me well know I love backpacks and technology cases! And, for some reason, I especially love technology items that are pink. 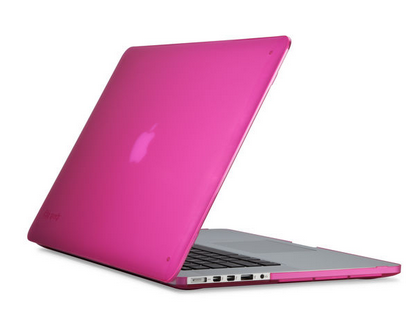 I have always thought the juxtaposition of hard-core technology hardware and the color pink was interesting! When I read Speck had released two road-warrior backpacks, the MightyPack and MightyPack Plus, and they were available in a backpack that was "Zinfandel Pink/Pomegranate Pink, Polor Grey, and Glitter Pink", I wrote and requested a review copy. I received a note from the Speck rep, asking me what device models I use, and I received a (mostly) pink present in the mail yesterday! I have used Speck hardshell cases on many of my computers over the years and I have always loved them. They kept my laptops in pristine condition, even with all my traveling. And my first iPad Air slim case was a Speck case. I am a minimalist when it comes to protecting my technology devices. I like slim and lightweight protection. The MightyPack backpacks come in two models-- MightyPack ($79.95) and MightPack Plus ($99.95). The MightyPack (pictured above) is 17.9" H x 6.3" D x 11.8" W and weighs 1.8 pounds. The MightyPack Plus is a little taller and deeper at 20" H x 6.7" D x 11.8" W and weighs 2.2 pounds. The difference between the two models is that the MightyPack Plus includes a TSA check-point friendly option that allows the laptop compartment to open flat for easy screening without having to remove the laptop from the case. The other features of the two MightyPacks are similar. The MightyPack backpack includes a hard-sided compartment at the top which is lined with fur and includes a mesh pocket, too. This is an invaluable feature for holding those items that need to be protected, such as headphones, sunglasses, cameras, and phones, as well as providing easy access to these devices when the backpack is in the airplane overhead or under the seat in front of you. The front pocket is zippered on three sides, which provides easy access and includes one slip pocket, three mesh pockets (two-half width, one full-width), and a passthrough opening to the back compartment to allow for charging of devices. There is a nice padded grab handle at the top and the bottom and bottom corners are very padded to provide protection for the devices. The back compartment includes dedicated padded pockets for both a laptop (up to 15") and a tablet. There are two slots for a pen and a larger stylus, and two half-width slip pockets. The back of the MightyPack backpack is padded and has padded straps, too. One of the straps has a pocket which will fit a smaller smartphone or a snack bar. There is a small zippered pocket on one side of the MightyPack that fit my iPhone 6s+ in a slim case with some finagling. The one thing missing from the back of the MightyPack backpack, in my opinion as a road warrior, is a wide fabric strap to go over the handle on a piece of rolling luggage. I often need to have access to items in my backpack before taking off and after landing, and it would be nice to be able to "attach" it to the luggage so I can easily get to the items I need. The Speck DuraFolio cases are available for both the iPad Air and the iPad Air 2 ($59.95), as well as the iPad Mini ($49.95). This slim case (0.3" in depth) includes sleep/wake magnets in the cover as well as two ways to fold it for both typing and viewing. The front cover also fold around to the back for easy one-handed reading on the iPad. It comes in various colors, but the one I received is Fuchsia Pink and White! The bezel around the iPad is a little bit raised to protect the screen of the iPad if it is dropped on its face. In addition, the DuraFolio has met or exceeds the Military Drop Test Standard, which is a standard to determine the durability of equipment after repeated free-fall drops. These cases are thin, sturdy, and snap-on easily to the top and the bottom of the laptop. They allow full access to all the ports on the laptops, and the bottom part of the case has rubber feet to keep your laptop safe from sliding while using it. I have had Speck SeeThru cases for all my Mac laptops over the years. I have found that they fit nicely over a thin vinyl skin or decoration, too, if you have one of those applied to to your laptop. Since I am one that often sells my laptops, the Speck SeeThru cases keep the top and bottom of my laptop looking brand new! I spent some time looking around Speck's website to see what else they offered in pink. There is a Crimson Red/Splash Pink Candyshell Apple Watch protector ($29.95) I could get for my Apple watch. There is a Fuchsia Pink/Cupcake Pink/Heritage Grey Mightyshell iPhone 6s Plus case ($54.95) I could purchase for my phone. There is a Raspberry Pink/Pomodoro Red iPod Touch 6G and 5G case on sale for $12.99 I could pick that up for my iPod Touch. Speck does have pink cases for Samsung phones and a pink Galaxy Note Pro 12.2 and Tab Pro 12.2 case ($34.99) (but I don't have either of these products). And they have a pink Fitfolio case for both the Galaxy Tab 3 7" (see for $17.99) and 10.1" (on sale for $19.99), if you have one of those. There is also a Fitfolio Verizon Ellipsis 7 case in pink for $24.99 and one for the Ellipsis 8, too, if you have either of those devices. Pink tech cases, backpacks, and protectors are to my liking, but Speck offers great items in many colors and styles for all the newest devices, so visit their site!